We are delighted to announce that at a reception at Parliament, The Alcohol Health Alliance have just presented the Best Members Campaign Award to Balance for their alcohol cancer campaign – Can’t See It. A deserved piece of news to a very hard working team. North East drinkers are more likely to be drinking above recommended limits, putting themselves at greater risk of a range of different cancers including mouth, throat, oesophageal and bowel cancer. That was the warning from Balance as their hard-hitting new campaign launched urging people to take action to reduce their risk of seven types of cancer by taking more days off drinking for the sake of their health, family and loved ones. Sales figures show enough alcohol is being sold in the North East for drinkers to consume 22.3 units per week on averagei compared to the Chief Medical Officer’s guidance which recommends no more than 14 units. That compares to the England and Wales average of 20.8 units sold per drinker, potentially putting people in the region at higher risk of 7 different cancers, including mouth, throat, oesophagus, breast and bowel. Alcohol causes nearly a third (30%) of mouth and pharynx (throat) cancers, over a fifth (21%) of oesophageal cancers, over one in ten (12%) bowel cancers, 9% of liver cancers, 25% of laryngeal cancers and 6% of breast cancersii. Most recent data shows that nearly a third (32%) of all new cancer cases registered in the North East – some 5,374 in 2015iii – were made up of these cancer types. The latest Chief Medical Officer’s drinking guidelinesiv advise no more than 14 units per week to keep health risks low – that’s around six standard glasses of wine or six pints of beer or lager per week. 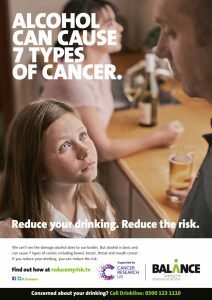 The TV and digitally driven campaign encourages people to visit www.reducemyrisk.tv to participate in a short quiz about their drinking habits and download free tools like the Days Off app. Colin Shevills, Director of Balance, said: “It is everyone’s right to know the fact that regular drinking, even one drink a day, increases your risk of some types of cancer, even if that might feel hard to accept. “One of the problems is we have very low awareness of the risks. Many people think they are drinking moderately, but are actually in the higher risk category. The recycling bin can show you just how much you are drinking. The Balance campaign, which launched in September, will see a new emotionally engaging TV ad showing a family and a child worrying about her dad’s regular drinking. The campaign is also being supported by Cancer Research UK. iFigures for the North East supplied by NHS Health Scotland based on regional alcohol sales data using the framework for Monitoring and Evaluating Scotland’s Alcohol Strategy (MESAS) monitoring report 2017, bringing together the latest available data on key alcohol indicators in Scotland. iiParkin DM. Cancers attributable to consumption of alcohol in the UK in 2010 (link is external). Br J Cancer 2011;105 (S2):S14-S18. From Cancer Research UK website.